I have had a male sugar glider for a year now. I originally bought two gliders but one of the owners told me that I was getting a female and as he got older we found out he was a male. So I gave one of my gliders up for adoption. Recently, I got a female glider. 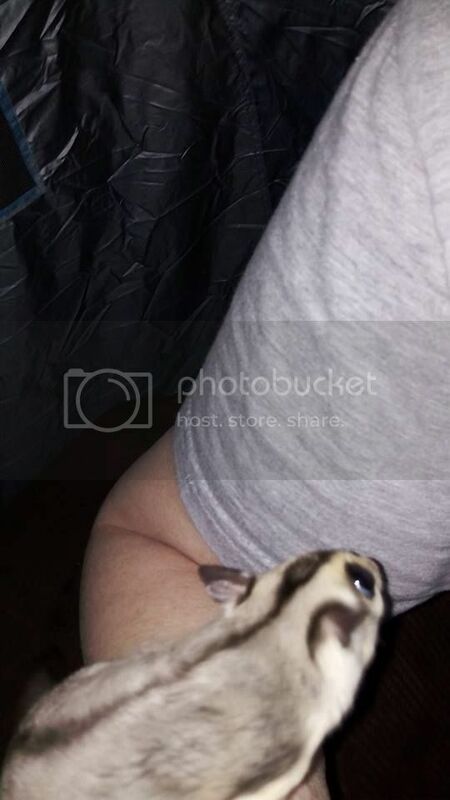 She is 18 months old and has no experience being around other gliders. She has been living in a very large custom cage with my male glider for four weeks now. When we first got her, she was really nice and sweet; however, the past 2 weeks she has been so vicious that I can't even put my hand into the cage. She literally attacks any part of my body I put in there. When they are young, I would use my fist to put in front of them and they normally wouldn't bite it. If I used my fingertip, I would usually get nipped at. But this female glider will literally bite into my forearm. She bites down hard, shakes her head vigorously while grabbing onto my skin with her front feet. She draws blood every time I put my hand into the cage. Even if it's to feed them. Since I got her, she has been in a bonding pouch with my dirty sock. The beds in the glider cage both have my socks in them (I took out the nice blankets for the time being). I am married with two kids under the age of 7 and I don't want this glider to attack them and ruin their mental state when it comes to handling certain animals. I don't know what to do. This glider's original owners spoiled her beyond belief. She is so picky about eating food and must be given snacks on a daily basis or she ends up barking all night long. So, she definitely came from a loving home. The only reason they gave her up is because they just had their first child and they don't have time to give the glider the attention she deserves any longer. I plan on making a video of her attacking me and biting into my arm to show the original owners what's going on. When we last spoke to them, they couldn't believe that their glider would ever bite anyone like that. And I guess they both get along? The male is not neutered and yes they seem to get along very well. My male is always grooming her and she seems to like it. When I had another male, the two used to fight a lot. However, these two are getting along. Grooming, sleeping together, always next to each other, etc. We are planning on breeding them since I work at home 4 days a week and my wife is a housewife. Also, there aren't any reputable breeders in our city, so we want to spread the love. Last edited by madmaz; 04/26/18 10:10 PM. With that kind of attitude change I would say she has joeys in pouch and she is going to be a very protective mother. One of the joeys of breeding, some don't change others go all ninja on you. Already? The first time she met a male glider was 4 weeks ago. I can't imagine that she could have joeys in pouch already. What is the period of pregnancy for a glider? It takes 15 to 17 days for gestation then they climb into the pouch is my understanding. Thank you so much everyone. Hopefully she will be a sweet girl again someday. Since I wrote this, my little couple have been rather loud. Not sure how serious it is because it only lasts for about 3 seconds. Should I separate them?